There’s a definite ‘off-road’ theme to the news recently: with the likes of Liddell / Vergers / Bennett set to undertake the Preston Road Rally next month, and Petersen / White Lightning preparing for the Dakar, now we find that Allan Simonsen has today (November 15) set off on the 10th anniversary running of Classic Adelaide, a tarmac rally, in a Les Walken-prepared HLCA Mitsubishi EVO-9. Wednesday afternoon in Oz will have seen the drivers qualify for their starting order around the Clipsal 500 track: advantage Simonsen? "To get the opportunity to learn a new type of motor sport competition is always great and I just love to learn new tricks,” said the Dane. Classic Adelaide is normally reserved for classic cars which run in two classes: up to 1972 and 1973-1982. But modern vehicles are allowed to compete but register no official time. 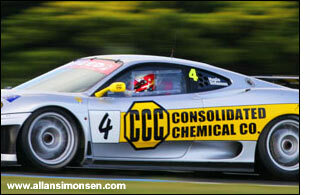 Meanwhile, Simonsen has been winning again in the Ted Huglin, ex-ACEMCO, Ferrari 360 - at Queensland Raceway this time. Saturday’s sprint race resulted in a straightforward win, but Sunday’s longer one produced another one of those Simonsen charges. Ted Huglin pitted after 20 minutes, in sixth place, handing over to Simonsen who returned to the track with a 45 sec deficit to the leaders. Two laps later a safety car was deployed, but it appeared to pick up the wrong leader and Simonsen became trapped behind it, effectively a lap down. When the safety car was released Simonsen knew he had a big task ahead of him and would need to unlap himself to bag the points. And so the chase started. 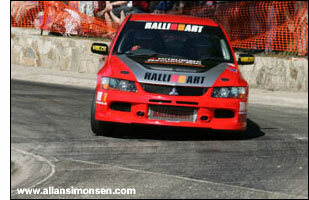 With just three minutes to go, the Dane had pushed the Ferrari 360GT back into the lead and took the outright win. "What a challenge! I wasn't sure if it was possible to win it but I love to come from behind and pick off the targets one by one. I think there was a mess up with the safety car but these things do happen in this game so you just have to drive around the situation. It was one exciting drive!"